Associate Professor Lynne McCormack is both a clinician and a researcher with over 40 publications in the field of complex trauma and posttraumatic growth. Her therapeutic work has spanned over three decades primarily working with those exposed to complex high risk environments or political and family/childhood trauma. This wealth of professional experience in the field of trauma underpins her role as supervisor on the clinical program at UON. Early postgraduate research explored the long-term psychological effects of war on civilian women, and her PhD research is an interpretative phenomenological study in primary and vicarious psychological growth following exposure to war, disaster, and genocide. Lynne also is an international Red Cross delegate and a member of RedRUK. As such, she volunteered her support in East Timor post-independence and in Aceh post 2004 tsunami providing psychological first-aid to those in need, and variably designing, facilitating and evaluating psychosocial and pre-hospital care programs for vulnerable communities. She has provided both logistic and psychological support to veterans/families of the Vietnam War, she continues to psychologically support all combat returnees and their families through counselling, and facilitating training workshops for DVA and the Veterans and Veterans' Families Counselling Service (VVCS). She is trained in Critical Incident Stress Management and has a long association with first-responders following critical incident. The unique stories of psychological growth that have emerged for many of her clients, despite exposure to horrific and catastrophic events, led to her research interest in the coexisting relationship between negative and positive effects of complex trauma. Current research projects include: looking beyond PTSD for understanding reintegration difficulties in both military and humanitarian international returnees; exploring transgenerational family violence particularly in reoffenders; developing retained social engagement programs for family carers caught in the trauma/growth of dementia; and interpreting the ‘lived’ experience of refugee status. She regards individuals as the ‘expert’ in their own lives and appreciates the many ways in which individuals resource their own talents and skills for wellbeing. Their stories of psychological growth out of adversity are the food of good qualitative research. She is grateful to have been honoured with the Logistic and Support Medal by the Australian Government, and the Paul Harris Fellow Award from Rotary International for humanitarian services. Dr Lynne McCormack is both a qualitative and quantitative researcher. However, she is particularly experienced as an interpretative phenomenological researcher and in the use of Interpretative Phenomenological Analysis (IPA), a methodology well suited to explore the subjective 'lived' experience of trauma. She has recently published with colleague Professor Stephen Joseph, University of Nottingham: PHENOMENA, a 9-step guide to avoiding pitfalls with doing IPA in SAGE research Methods Cases Psychology. Her many papers include insights into phenomena poorly understood including threat of war, genocide, disasters, policing, bush-fires; professional derailment and impact of war on children of veterans. In light of the grim statistics on relational and family violence worldwide, she is passionate about developing societal programs for reducing the intergenerational violence within families that contributes to ongoing domestic violence and childhood abuse. Her international collaboration with Professor Stephen Joseph includes many publications and the development of a specific assessment tool for 'reintegration distress' following overseas deployment (PostAID/Q) for use with humanitarian and military personnel. Ongoing collaboration with Professor Victoria Tischler, Centre for Dementia and Art at the University of West London, has led to publication and possible future links between the Centre and UON. Her research continues with Dr Bruce Walmsley and the development of programs for relational social engagement in families with dementia. Her desire to better understand and reduce the level of gender related violence, particularly transgenerational violence and trauma, has led to a collaboration with colleagues in Law here at UoN and at the Australian National University. She retains her contact with Professor Charles Figley of Tulane University, USA and is a contributor to Encyclopedia of Trauma edited by Professor Figley. International Visiting Fellowship Grant - Professor Victoria Tischler, Dementia Centre University of West London ($7000). Dr Lynne McCormack's primary research is in the construct of posttraumatic growth and distress to which she has contributed further through her research findings. Most of her collaborative research in this area is with Professor Stephen Joseph through the Centre for Trauma, Resilience and Growth at the University of Nottingham. This collaboration has contributed to the development of an assessment tool for aid personnel reintegrating following overseas humanitarian deployment. Collaboration with Professor Victoria Tischler, University of West London, links into the newly established Centre for Dementia at UWL. This sits at the interface of her work with Dr Bruce Walmsley, HammondCARE and the development of a positive intervention program/APP for families caring for a family member with dementia. Recently, she has begun collaborations with the School of Law at UoN and School of Law ANU resulting in a grant from Finance and Innovation NSW to develop a psych-APP to be used by apprehended violence orders/reoffenders. Ongoing collaboration continues within the UoN School of Psychology and the Centre for Resource Health and Safety, Faculty of Health and Medicine UON, chaired by Associate Professor Mark Rubin. Dr Lynne McCormack has a long teaching history beginning as a secondary teacher in drama and music. As a psychologist she has designed, developed and evaluated health and psychosocial programs following conflict and disaster. She has facilitated and conducted training workshops in leadership including facilitating RYLA and RELAYID, youth leadership programs in Rotary for 5 years. Such programs are inclusive of workplace conflict, or provide educational and cognitive behavioural strategies following critical incident. She was contracted to develop in-hospital programs in Combat PTSD and CBT and Chronic Pain. Currently, she teaches and co-ordinates modules on the Clinical/Doctoral postgraduate program. Lynne has numerous students who seek to conduct their own research attached to her projects and supervises provisional clinical students in the University Psychology Clinic. She is often asked to speak as an ‘expert’ on trauma on radio and for journalists (see Cloud). Dr Lynne McCormack has managed her own consultancy practice administering staff and business needs. She was engaged to develop and manage the Newcastle Private Hospital psychology unit providing staff and patients with psychological services and education. She has designed, monitored and fund-raised for humanitarian projects in East Timor and Africa. She supervises clinicians and students in professional development, manages a trauma lab for her research students and supervises PhD, Masters and Honours research theses through research development to ongoing publications. She currently coordinates modules on the Clinical/Doctoral postgraduate program. As a senior lecturer and clinical psychologist at the University of Newcastle, Australia registered in both the UK and Australia, Dr Lynne McCormack must continue to practice to supervise the clinical students on the university clinical programs. Her work as a trauma therapist and psychosocial programmer over the last 25 years has included international aid, private practice, hospitals, education, military and front-line emergency services with a focus on the psychological wellbeing and safety of those exposed to high-risk environments i.e. war, genocide, and humanitarian emergencies. Much of her research highlights the interface between negative and positive responses to complex trauma for providing a platform for posttraumatic growth. Lynne is a Psychosocial Delegate with the Red Cross/Red Crescent Movement and an associate of the Centre for Trauma, Resilience and Growth, Nottingham UK. © 2019 American Psychological Association. The 2014 Ebola epidemic in Sierra Leone, West Africa, was a public health crisis that triggered international fear, border shutdowns, and a declaration of an unprecedented international public health emergency. However, no known research has explored the subjective experience of international humanitarian health care workers deployed to provide on-the-ground support during the Ebola epidemic. This phenomenological study explored the subjective interpretations of 5 career-international Red Cross/Red Crescent health care delegates who deployed to the 2014 Ebola epidemic. Data were collected using semistructured interviews, transcribed, and analyzed using the protocols of interpretative phenomenological analysis. One superordinate theme: Beyond human fear and catastrophe: I can&apos;t save you, but I am here; overarched four subordinate themes: Calm amidst hysteria; Living in a pressure cooker; Journeying alone; Altruistic authenticity. These themes reflect the heavy burden felt by these participants in response to a strong altruistic call-"Who will go if I do not?" "Like no other" humanitarian deployment, unquestionable allegiance and trust among in-the-field colleagues were the only barriers against sudden and untreatable death. Official and societal criticism postdeployment precipitated social retreat wherein feelings of isolation and invalidation threatened psychological well-being. However, a strong sense of altruistic commitment remained unwavering and protective against psychological debilitation, as did positive support from the deploying organization. Despite daily confrontation with death, hypervigilance, and fear, altruistic purpose remained the beacon for professional and personal integrity in these participants. It counterbalanced the distress of isolation and invalidation from societal criticism. We recommended that strength-based predeployment humanitarian training is prioritized by deploying organizations. © 2017 American Psychological Association. The subjective voice of experiencing out-of-home care (OoHC) in the aftermath of removal from family of origin is poorly researched. This phenomenological study explored the "lived" experience of OoHC from the perspective of 4 adult care leavers reflecting on their childhood. Seeking both positive and negative interpretations, semistructured interviews were analyzed using interpretative phenomenological analysis. Two superordinate themes-unconditional is conditional and learning to walk with self- highlighted juxtaposed layers of complex traumatic distress and psychological growth for these participants. Conversely, as they navigated loss of family of origin and the expansive foster care system into which they were thrust, distress appeared to stimulate the emergence of self-reliance as a barrier to further traumatic loss. They spoke of nebulous and ambivalent commitment from new carers that repeatedly inhibited relational depth; however, the occasional glimmer of genuineness was remembered and appeared to facilitate doing "it" differently in adult life. Crucially this study highlights that foster parenting in OoHC has the potential to nurture healing from family of origin trauma but invariably contributes to cumulative distress on earlier childhood trauma. As such, foster parenting requires a unique ability to engage relationally with traumatized children. Poor remuneration and screening, and lack of training in healing and reparative support for childhood trauma, will continue to risk the future adult mental well-being of children placed in OoHC. © 2016 Informa UK Limited, trading as Taylor & Francis Group. The psychopathological impact of parental mental ill-health on children is well known. However, little research explores positive and negative interpretations of such exposure in childhood, from the adult child&apos;s perspective. Using interpretative phenomenological Analysis this study sought subjective interpretations of the ¿lived¿ experiences of growing up in a family with parental mental ill-health. A purposive sample of seven adult children provided data for analysis through semi-structured interviews. One superordinate theme: A fractured journey of growth to adulthood, overarched six subordinate themes. Four themes captured stigma, shame, social isolation and betrayal. Juxtaposed with this, two themes captured purposeful redefinition of self and psychological growth. This study captures the chronicity of traumatic distress and sense of betrayal experienced by these participants in childhood through unrelenting exposure to parental mental ill-health. However, despite unpredictability, fear, and neglect in childhood, they identified the emergence of inner strengths in adult life: unexpected growth in empathy and compassion, high resourcefulness, and personal authenticity through higher education. Findings highlight that positively redefining ¿self¿ in adult life is possible in the aftermath of childhood trauma associated with parental mental ill-health. Implications for therapy include: (a) moving forward from childhood trauma and (b) managing ongoing family dynamics in adult-life. © 2016 American Psychological Association. How individuals experience reintegration postcombat and subsequent military discharge is a poorly explored phenomenon, though for many service personnel it is fraught with complex psychosocial hurdles. Therefore, seeking both positive and negative interpretations of this phenomenon, semistructured interviews explored the ¿lived¿ experience of 5 former military personnel. Using interpretative phenomenological analysis (IPA) 1 superordinate theme emerged: shaping and breaking: who am I now? and overarched 5 subordinate themes. Four themes encapsulated the search for post war identity in these former military personnel. As such, narratives revealed that each participant grappled to understand a destabilizing sense of betrayal beyond leadership malpractice. This was interpreted as an enduring organizational failure that was cumulative on core morality changes from exposure to war. Psychological injuries remained fresh and raw despite years since discharge. Memories of feeling discarded, lost, and alone rekindled the self-doubt, distrust, and depleted confidence that fostered an inability to readily reengage with civility, with loved ones, and society. Turning on self, intrinsic blame fueled either self-loathing or retreat into silence or rage. A fifth theme revealed tenuous insights where minimal acceptance, some redefining of altruistic identity, and hope could emerge. Findings are discussed in light of these results, particularly the role of organizations in providing immediate supportive validation of deployment experience where validation of moral distress and identity disruption are inclusive in reintegration programs nurturing recovery and psychological wellbeing. © 2016, © Informa UK Limited, trading as Taylor & Francis Group. Objectives: Limited research explores the medical model of residential care in dementia from the family caregiver&apos;s perspectives. Method: This study sought subjective interpretations of nine family caregivers who experienced relinquishing their status as primary caregiver to a medical model, dementia care residential setting. Following semi-structured interviews and transcription data was analysed using interpretative phenomenological analysis. Results: One superordinate theme, navigating ¿system¿ control, overarched three subordinate themes: connecting/disconnecting, windowsclosing, and capacity forsensation. Navigatingsystem control reflected participants&apos; experience of circumnavigating a medical system fraught with hierarchical challenges inclusive of a complex maze of contradictions that appeared threatening, yet appeared comforting; authoritarian, yet often humane. For them, care of self, while advocating for a family member with dementia, required vigilance to manoeuvre a system of care that imposed its uninvited authority at will. Connection/disconnection highlights the enduring struggle for inclusivity in caregiving despite the omnipresent trauma of windows closing. Psychological growth came to these participants through an unexpected capacity for sensation which offered a unique lens to communication with the family member with dementia primarily through sensory exchange. Conclusions: Models of dementia care and therapeutic interventions could inclusively involve dementia family caregivers who may be experiencing traumatic distress, and associated guilt, stigma, loss, and grief. Co-existing psychological wellbeing, however, is possible when family members are encouraged to transition communication to sensory awareness and exchange as windows close. © 2016 Informa UK Limited, trading as Taylor & Francis Group. Background: Playback Theatre is applied theatre that draws on real-life stories from its audience to reflect the psychosocial needs of individuals and communities. Contemporarily it is being used to support those exposed to war/disaster; however, the impact of such work on its practitioners, is under researched. Methods: Using interpretative phenomenological analysis positive and negative subjective interpretations were sought from five Western Playback Theatre practitioners who taught in post-civil war Sri Lanka. Results: One superordinate theme, Naivety, Humility and Hope amongst the Rubble, encompassed five subordinate themes. These reveal an integral struggle experienced by Western practitioners unprepared for a culturally different lens. Conclusion: Teaching Playback Theatre in post-war Sri Lanka for these practitioners exposed the gap between the desire to help cross-culturally and their experienced reality. Over time, the collision of Western naivety with good intent facilitated an integral and humble search to be wiser humanitarians cross-culturally in these participants. © 2016 American Psychological Association. Objective: No known research explores the double-edged phenomenon of childhood trauma/adult mental health consumer. Therefore, whether receiving a psychiatric diagnosis in light of childhood trauma supports or impedes psychological wellbeing in adult life, is unknown. Method: Interpretative phenomenological analysis (IPA) provided the methodological framework. Data were collected through the use of semistructured interviews. Analysis sought thematic representation from subjective interpretations of the experienced phenomenon: childhood trauma survivor/mental health consumer. Results: Data revealed 1 superordinate theme, Childhood Betrayal, Identity, and Worthiness, that overarched 5 subordinate themes a) legacies, (b) the label, (c) putting the jigsaw together, (d) stigma, and (e) better than good enough self. Legacies of doubt that perpetuated "not good enough" delayed the development of an adult identity of worthiness in these participants. Importantly, the right diagnosis separated self as worthy-adult from self as traumatized child and facilitated positive change for breaking harmful cycles, self-valuing, and increased empathy, wisdom, and patience. Conclusions: Findings inform future research and therapeutic practice in regards to adult help seeking behaviors in light of childhood trauma, often postponed through fear of stigma associated with mental health diagnoses and services. Similarly, findings suggest that ameliorating wellbeing may be dependent on a therapeutic relationship in which accuracy or right fit of diagnosis provides a conduit for the client to disengage from self-blame, unworthiness, and "not good enough. © 2016 American Psychological Association. Little research has included exploration of the interpreted experiences of a childhood overshadowed by a parent¿s distress from war. It is important to note that whether being parented by a combat veteran impacts psychological well-being both positively and negatively is unknown. In this phenomenological study, we sought positive and negative interpretations of childhood from the perspective of adult children of Vietnam veterans diagnosed with posttraumatic stress disorder (PTSD). Data were collected through semistructured interviews and analyzed using interpretative phenomenological analysis (IPA). One superordinate theme, making sense of the imposition of war, overarches (a) tragic and turbulent young years and (b) knowing, absolution, and posttraumatic growth. These subthemes encapsulate (i) the interpersonal blame and shame that tenaciously, undermined the ¿self¿ throughout their childhood, and (ii) the slow emergence of the self as not responsible, able to absolve, and psychologically grow out of their adversity. Youthful ignorance of a complex war left these participants not understanding why the heavy burden of responsibility became the child¿s remit for a father emotionally absent. The opportunity to reexamine childhood distress in adult life has revealed harmful patterns of relational engagement learned in childhood that have repeatedly dogged their adult lives. This honest reappraisal of self has allowed nonjudgmental self-regard to emerge. Forgiveness has been offered to fathers when true reparation was sought. However, nonabsolution did not preclude psychological growth, with positive self-regard replacing misplaced responsibility and self-blame. Therapy can support the coexistence of distress and growth in the aftermath of a father¿ child relationship irrevocably impacted by combatrelated trauma. In doing so, the ¿growthful¿ domain of self-acceptance may facilitate respectful choice in future adult relationships. © 2016 Taylor & Francis. This study explored the dual phenomenon of experiencing a peer support residential trauma program from the perspective of (a) a client, and (b) a facilitator. It sought both positive and negative subjective interpretations. Participants were former clients and current facilitators of the program. Data were collected through a focus group, and analyzed using interpretative phenomenological analysis. One superordinate theme, altruistic growth, overarched 2 subordinate themes. The first, modeling through respect, included subthemes of respect and hope and empowerment. The second subordinate theme, reciprocal model of care, encapsulated personal challenges such as facing the mirror, old demons, and burnout and breaking points. Conversely, participants mused on these challenges as opportunities for further healing through opportunities for self-nurturing and gratitude. Implications for treatment of adult survivors of childhood trauma are discussed. For facilitators, the program was seen as offering further personal reflection and a giving forward that was interpreted as altruistic growth. © 2015, © The Author(s) 2015. Minimal research explores the impact of dementia and a dementia diagnosis on families from the unique vantage of senior health professionals. The participants of this study, eight senior aged care professionals, provided unique interpretative insights into family dynamics and sense-making on the journey with dementia, and their own role in that journey. Both positive and negative perspectives were sought. Data from semi-structured interviews were analysed using Interpretative Phenomenological Analysis (IPA). One superordinate theme, Dementia naiveté; redefined intimacy, overarched Embarrassed shame; Maintaining hope; Redefining a model of intimacy; and Redefined relational intimacy and growth. Within these themes, the participants shed light on hurtful embarrassment and shame experienced by families associated with the diagnostic label given to a loved one. This label was perceived to either trigger separation, hurt and immobility through ignorance, or precipitate a frenzy of naive yet hopeful energy for seeking that elusive cure. The participants saw their role as one of enacting a new way of connecting what was with what could be. Thus, they modelled advocacy, integral care and relational intimacy. Validation came in witnessing a redefining of intimacy in many families who were able to embrace that holistic and empathic approach to the shifting presentation of dementia. Psychological well-being was observed to occur when families embraced growthful domains, e.g. acceptance, hope, relational closeness and altruistic concern for other families. Implications for future care models are discussed. © 2016 American Psychological Association. The potential for acute and cumulative exposure to traumatic events associated with policing is well recognized. However, research exploring the subjective impact of that trauma, particularly when it results in discharge with a diagnosis of posttraumatic stress disorder (PTSD), is significantly limited. Drawing on a phenomenological epistemological position, this study explores the subjective ¿lived¿ experience of 7 former police personnel medically discharged with PTSD. It sought both positive and negative interpretations of (a) their personal experience of policing; (b) consequential discharge with PTSD; and (c) life after discharge. Using interpretative phenomenological analysis (IPA), semistructured interviews provided the data for transcription and analysis. One superordinate theme: moral betrayal, silence, and hope in policing trauma; overarched 4 subordinate themes: eroded identity; moral betrayal; confronting the silence; learning to depend on me. These interpreted themes mirror multiple layers of complex policing trauma in these participants that over time eroded hope. They reveal a growing awareness of moral injury that only found voice, postdischarge. Chronic exposure to policing trauma was experienced as a domino effect slowly diminishing self-worth and consequently corroding their earlier sense of purpose as police personnel. Intrinsically, shame was interpreted as having failed. Discharge dissociated them from the collegial support necessary to reintegrate into their postdischarge lives. Instead, former altruistic selves became reclusive. These participants attributed ¿felt¿ distress as directly attributable to organizational factors that left them feeling invalidated, betrayed, and without support. Over time, some experienced a newfound appreciation of ¿self,¿ facilitated by hope. Implications for clinical practice and policy are discussed. © 2015, © The Author(s) 2015. Minimal research explores the impact of a career in dementia care on senior health professionals. This study sought positive and negative subjective interpretations from seven senior health professionals regarding their experiences in dementia care. Data from semi-structured interviews were analysed using interpretative phenomenological analysis (IPA). One superordinate theme, Honouring stigmatised self, overarched four sub-themes: Systemic stigma, Invalidated, Self-respect and Moral integrity and Growth. Stigma was interpreted as systemically entrenched minimisation of aged care and the aged-care workforce, including poor remuneration and training. Participants experienced peer invalidation particularly when attempting to resolve complex professional and moral challenges in dementia care. These often occurred in the context of efforts to individualise care, constrained within a medical model. Paradoxically, external invalidation motivated a search for redefining ¿self¿ and moral integrity. By wisely acknowledging career experience, growthful domains of self-respect, optimism, humility and innovation defined professional practice and personal choices. Implications are discussed. © 2014, © The Author(s) 2014. A paucity of research explores both negative and positive changes for family members supporting a loved one with dementia, especially when communication by speech and awareness of others diminishes. This qualitative study sought the views of family groups concerning their experiences over the past 10 years supporting a loved one with dementia. A focus group sought negative and positive subjective interpretations of this phenomenon. One superordinate theme: Synthesis of Meaning emerged from the data using interpretative phenomenological analysis. This overarched two subordinate themes: (a) Steps backward¿encompassing those times when relatives hovered uncertainly, missed opportunities to engage due to advancing dementia, and felt regret and (b) Steps forward¿encompassing moments of unexpected rewards, acceptance, self-forgiveness, and empathic connection with others on a similar journey. This study highlights that although often fraught with distress, positive aspects of the dementia journey are possible and offer opportunity for psychological growth and well-being. There is minimal research investigating non-speech communication as a result of living with severe dementia. This phenomenological study explores retained awareness expressed through non-speech patterns of communication in a family member living with severe dementia. Further, it describes reciprocal efforts used by all family members to engage in alternative patterns of communication. Family interactions were filmed to observe speech and non-speech relational communication. Participants were four family groups each with a family member living with non-speech communication as a result of severe dementia. Overall there were 16 participants. Data were analysed using thematic analysis. One superordinate theme, Dance of Communication, describes the interactive patterns that were observed during family communication. Two subordinate themes emerged: (a) in-step; characterised by communication that indicated harmony, spontaneity and reciprocity, and; (b) out-of-step; characterised by communication that indicated disharmony, syncopation, and vulnerability. This study highlights that retained awareness can exist at levels previously unrecognised in those living with limited or absent speech as a result of severe dementia. A recommendation for the development of a communication program for caregivers of individuals living with dementia is presented. © The Author(s) 2013 Reprints and permissions: sagepub.co.uk/journalsPermissions.nav. The onset of an eating disorder in middle-age men is poorly researched as are eating disorders in men generally. Therefore, life events that influence eating disorders in men, including delayed onset of an eating disorder remains unknown. Given the limited understanding of males with eating disorders and limited access to large samples of men with eating disorders, an in-depth analysis of a single case of a male in middle age with an eating disorder was chosen to gain insight and understanding into this phenomenon. A Life History approach explored the case of Joseph (pseudonym), who was diagnosed at age 44 years with an Eating Disorder Not Otherwise Specified. Data were collected through (a) life course open-ended questioning through interviews, (b) written statements, and (c) comments on transcripts. Three themes emerged, loss and unworthiness, becoming bigger, and wanting to change reflecting eating behaviors associated with attachment disruption, loss and trauma, body dissatisfaction, and negative affect. Later in life, an emotional "tipping point" precipitated an eating disorder. Results indicate traumatic loss leading to early attachment disruption as influential in Joseph&apos;s delayed onset of an eating disorder. The value of thorough narrative life histories during therapy when eating disorders occur late in life is discussed as well as the significance for men. © The Author(s) 2013. There is a paucity of research into the subjective experiences of humanitarian aid personnel exposed to modern global conflicts and disasters in the course of their work. In particular, little is known about how they make sense of any dual threat: (1) witnessing catastrophic and traumatic events perpetrated on those they seek to serve and (2) experiencing personal threat to self. This phenomenological study explores the idiographic interpretation of aid personnel working in complex humanitarian settings including exposure to genocide, and the impact of such exposure on reintegration processes postmission. Semi-structured interviews were conducted, and data were analyzed using interpretative phenomenological analysis (IPA). One theme: Complex humanitarian distress and growth overarched five subordinate themes. Four of the subordinate themes highlighted long term psychological distress including shame, moral doubt, betrayal, and narcissistic coping. The fifth theme, Reparation with &apos;self&apos;, describes a redefining of self-worth and altruistic identity over time despite earlier perceived moral failure and sense of rejection from organization and important others. Reparation with self, as a positive outcome from traumatic distress and lack of validating support from important others, is discussed in light of current posttraumatic growth literature. Implications for therapists and recruiting organizations are also discussed. © 2013 © 2013 Taylor & Francis. In light of the grim statistics on relational and family violence worldwide, a passion for alleviating childhood trauma often perpetrated through transgenerational violence has brought a collaboration between myself and colleagues in the Law School. Sher Campbell, UON and Colin James, ANU and I have joined forces supported by local lawyers in an attempt to evolve ways of assisting individuals and families in the aftermath of domestic violence. Our project has been accepted for a Finance, Services and Innovation NSW Government grant. This exciting project will cross pollinate with business and technology as we develop a psych-wellbeing phone APP for re-offenders of domestic violence introduced at the crucial stage between being charged and court appearance. The name and work described here is copyright. Apart from any use permitted under the Copyright Act 1968, no part may be reproduced by any process, nor may any other exclusive right be exercised, without the permission of Colin James, Lynne McCormack and Sher Campbell. Grant for SSP completed in UK with collaborations between Professor Stephen Joseph and Professor Victoria Tischler. Douglas, Rose, & McCormack (2017). The Psychometric Properties of Cognitive Confidence: Structure across Cultures in Working Adult Samples. The Journal of Psychology and Cognition. 1 (1): 81-90. A Building Experience and Skill Travel Scholarship (BESTS) is a research grant to broaden research experience and networks of contacts by fully funding up to two months duration at a host organisation anywhere in the world. The host organisation gives researchers the chance to broaden their understanding of research and collaboration skills in whatever sector they choose e.g. a university, a business, a government department, a charity, or a non-governmental organisation. 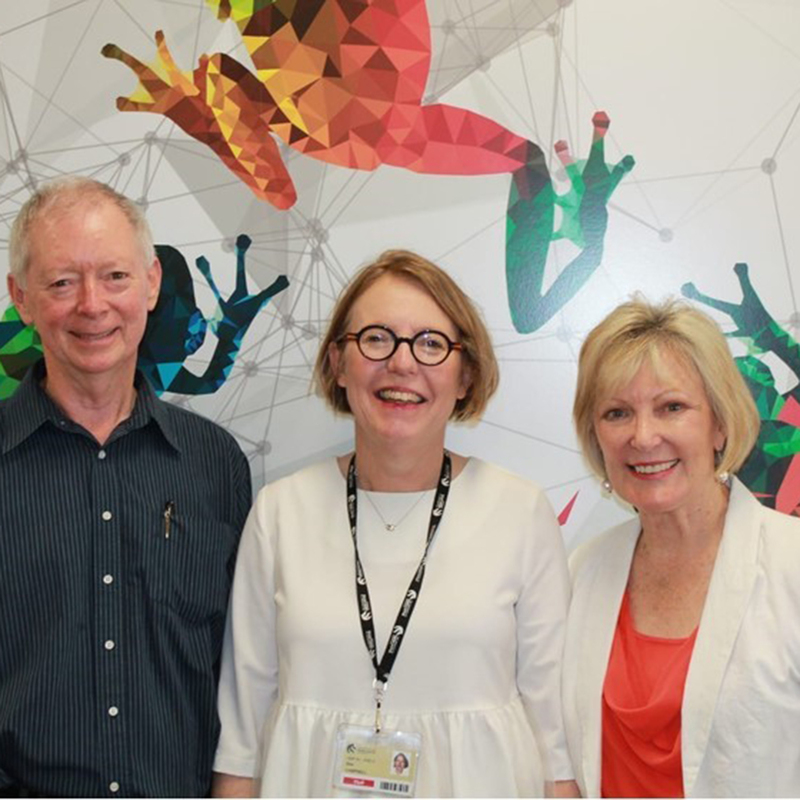 Dr Lynne McCormack successfully competed for this scholarship and spent the two months collaborating with Professor Catherine Tang at the National University of Singapore and Professor Paul Komesaroff at Monash University, Melbourne. Both of these collaborations have contributed to her ongoing research trajectory in the humanitarian sector and complex trauma. Professor Paul Komesaroff, medical ethics, is responsible for setting up a Health and Development Alliance (HaDA) to develop minimum standards for Australia humanitarian workers. This project devises a university based post graduate training program that is applicable across all professions in aid work. Professor Catherine Tang of National University of Singapore is a researcher in complex trauma and psychological growth following adversity. We have collaborated on our mutual work in psychosocial care following the South East Asian Tsunami. She had been instrumental in setting up a trauma module at the University of Hong Kong and I was interested in whether the University of Singapore had encouraged a similar focus given its central location in South East Asia. The Overseas Research Scholarships (ORS) is an international postgraduate award for selected foreign country nationals to undertake research at higher-education institutions (HEIs) in the United Kingdom. The award is among the most selective and prestigious awards offered to international students and scholarships are awarded on the basis of academic excellence and research potential. The Scheme is funded through the four UK higher education funding bodies (for England, Scotland, Wales and Northern Ireland). Dr Lynne McCormack was awarded the prestigious ORS for postgraduate research leading to her PhD: Primary and Vicarious Posttraumatic Growth following War, Genocide and Humanitarian Emergencies: An Interpretative Phenomenological Analysis. McCormack, L., Orenstein, A., & Joseph, S. (2016). Postmission Altruistic Identity Disruption Questionnaire (PostAID/Q): Reliability and Validity in measuring distress during reintegration following International Humanitarian Aid work. Traumatology. http://dx.doi.org/10.1037/trm0000053. On 26th December, 2004, a massive earthquake occurred under the ocean off the coast of Sumatra, creating a tsunami which swept along the western coast of Aceh, causing the world’s largest natural disaster in modern history. Danish Red Cross (DRC), who have extensive international expertise in psychosocial programming (PSP) in emergencies, applied to European Commission Humanitarian Office (ECHO) for six month emergency funding to start a psychosocial project in the affected western districts of Aceh. This included Psychological First Aid (PFA), development of a psychosocial programme (PSP) and identifying and referring those individuals who needed further psychiatric intervention. ECHO provided 1 Million (EURO) for the project. The specific operational objectives were to reduce the suffering of affected people of the tsunami disaster, to alleviate immediate psychological effects, reduce the risk of long lasting mental disorder and ensure the referral of identified psychiatric cases. DRC was asked to become the lead agency for PSP among the participating national societies. Dr McCormack was commissioned through the Australian Red Cross as a psychologist advisor and evaluator. Her role was to support local psychologists working with the bereaved families and displaced persons including orphaned children, and conduct the end-of-mission evaluative report for ECHO on design, outcomes, and lessons learned. McCormack, L. (2010). Using the ‘Most Significant Change Technique’ to evaluate a post-tsunami psychosocial programme. Qualitative Methodology in Psychology Bulletin (QMiP), Issue 9, May, 19-24. Timor-Leste (East Timor) post elections faced massive rebuilding with the destruction of most of the infrastructure and many citizens traumatised and deskilled. There was no ambulance service and those with related skills were either dead, in camps in West Timor, or in hiding in the hills outside Dili. A third of the nation had disappeared. Volunteer ambulance personnel from Australia attempted to offer help but with roads blown away and water and electricity in disrepair, the assistance was haphazard and creative to say the least. After the UN withdrew from Timor-Leste in 2002, there was no emergency recovery for the people on the island of Atauro or other outlying islands and one ambulance officer and one vehicle for service on the mainland. Many Australian paramedics had volunteered their services to Timor-Leste in the turmoil following post civil war elections, and on return described the lack of services for ill and injured. Grants were sought to design, conduct and evaluate a pre-hospital and emergency training program for surviving nurses post civil war in Timor-Leste. Dr Lynne McCormack took the lead raising the funds of $90,000 through AUSAid, Rotary Foundation and a Carl P Miller Grant. The project was threefold following collaboration with the newly instated Minister of Health: 1) the Minister of Health requisition a donated boat for the Ministry which was outfitted using some of the funds as an ambulance boat for the islands off Dili which had no emergency health care services; 2) Phase 1 was developing a Training Programme for personnel newly employed by the Ministry of Health and trained by Craig Hooper of APAC who was contracted to begin the process of developing the Ambulance Service in East Timor and commence training. This was evaluated and adjustments to needs made for further training; 3) over a 2 year period, 6 monthly training continued with support as the local personnel began to develop and evaluate their own professional development. As lead on this 3 year project , Dr McCormack was responsible for design, development and evaluation of the program, setting in place ongoing support, and incremental and final reporting to Republica Democratica de Timor-Leste Ministry of Health, AUSAid and Rotary International on the overall project outcomes and financial disbursement. The project and findings were presented at the Rotary Conference the following year, and a further collaborative project, the National Tuberculosis Project, gained traction from the outcomes, through the Australia/East Timor Community Assistance Scheme. Contemporarily, combat distress is viewed through a PTSD lens and regarded the most likely psychopathology impacting military personnel and their families. Colleagues or families are often first to recognize that a returnee is not psychologically well. If not appropriately addressed, long-term psychological consequences for partners and children are also likely (McCormack et al., 2011; McCormack & Sly, 2013; McCormack & Joseph, 2014; McCormack & Devine, 2016). However, we believe that there is more to post-deployment psychological distress than posttraumatic stress (PTS) impacting healthy reintegration with families by military personnel. Specifically, The present research will investigate other non-PTSD factors: altruistic identity disruption and moral injury; as additional likely causes of post-deployment problems. An EOI has been submitted for $48,973. This study will pilot a relational social engagement (RSE) program for families on the dementia care pathway. It has been developed from recent studies by Walmsley and McCormack (2014, 2016a, 2016b, 2016c, in press) in which the construct of RSE was recognised from the interface between psychological distress and psychological wellbeing in families who live with the impact of dementia. The program will present an RSE framework for families to use in their communication with each other promoting (a) positive adjustment to the dementia care pathway, (b) ongoing relational and social engagement with a family member who lives with dementia to assess the program. Outcomes will be assessed and inform larger studies. Grant application: Altzhemer's Australia Dementia Research Foundation (AADRF) $49,841. This grant application is to seek the visit of Professor Victoria Tischler, University of West London, an expert in Dementia and the Arts. She has established the Centre for Dementia in London and having worked together on various projects in the past are looking to connect UoN and UWL's Dementia Centre for future collaboration. ‘The AVO App’(c) - We’ve got your back! Grant from Services, Finance and Innovation NSW. Transgenerational trauma and Domestic Violence. Development of a youth program for changing gender specific violence behaviours in reoffenders – START-UP joint project initiative between schools of Law and Psychology. Up to $150,000 to develop it through an ‘incubation process’. Link: https://launch.innovation.nsw.gov.au/reoffending.